Paul and I met through a mutual friend, Ian Hales, who encouraged me to attend a ride with his motorcycle club. Ian had heard that I was planning to sell my motorbike, as I had lost heart and was thinking of giving up riding after a few falls and a rough start – Ian’s invitation to join the club ride was his way of encouraging me to keep on going. That is how I came to meet Paul and our love for motorcycles soon grew into our love for each other. We live in Sydney, Australia and are both full time professionals who live a simple life and for the next adventure. We share the view that opportunities should be seized and Paul coined our partnership mantra which is “just say yes”. Paul dared me to “just say yes” to our first date and since then I have been “just saying yes” to so much more which has become our wonderful life together. We have a quaint little wooden cottage near the Ku-ring-gai National Park, which we have affectionately named ‘The Love Shack’ and consequently none of our adult children want to live with us. That grants us the luxury of space to focus on our life together and indulging our adventurous spirits. We have met incredible people and experienced beautiful places, riding motorcycles both on road and off. Each trip has brought us closer to each other and ourselves, building our confidence and our dreams of more. In our early days of getting to know each other Paul shared with me his dream of travelling around the world on a bike and I shared with him my dream of ‘still wanting to do a gap year!’ It was important to us both to do something adventurous which meant world travel so we set ourselves a goal of attaining it in 5 years’ time. I approached Paul with the question: “Why we are waiting for our 5-year plan and why shouldn’t we just do it sooner?” This once again brought us to a decision to “just say yes”, and start our journey. 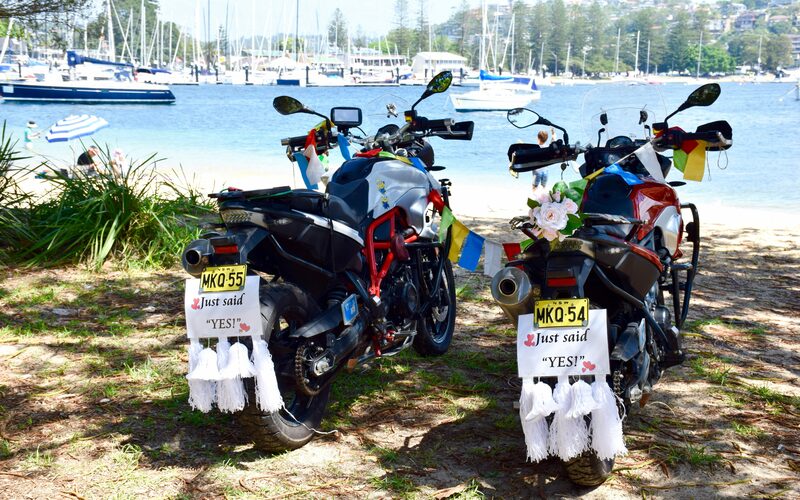 In 2016 Paul bought “his-and-hers” BMW GS F700’s and posed the question: “Marry me and let’s travel the world!” I was once again gifted with an opportunity to “Just Say Yes!” …and I did…I do! This blog aims to capture our journey from planning stages through to travelling on motorcycles across the globe. How amazing! I LOVE IT!! I wish you both happy trails and many, many miles of adventure! Can’t wait to follow along! So wonderful to meet you both today! Keep in touch! We will definitely follow your journey. How exciting! All the best with trip prep. -Angela, SHK. Have a wonderful time and savor every mile. Looking forward to seeing what you are up to.